Make the most of your exhibition display by adding exhibition stand accessories designed to maximise your brand’s impact at any event. From leaflet dispensers to portable counters and iPad stands, exhibition accessories are guaranteed to really make your business stand out. Our wide range of accessories are perfect for adding a professional finishing touch to your display stand. Small accents such as spotlights are ideal for highlighting and drawing attention to key aspects of your stand or for adding a spotlight to particular products. 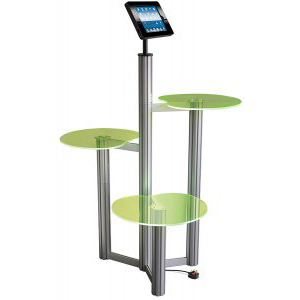 iPad stands create an interactive edge allowing you to communicate and engage with your audience for longer. Create a professional meet and great area on your exhibition stand with the added benefit of internal storage and extra marketing presence for almost any event. Our printed tablecloths are an inexpensive way of creating a professional first impression, offering exceptional quality with vibrant artwork for a small cost. Professional presentation of marketing material is extremely important when exhibiting. 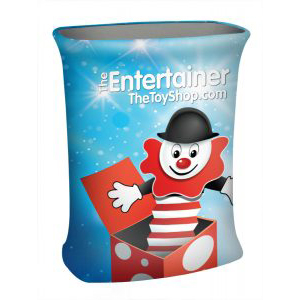 Our portable leaflet dispensers are available in a range of styles and sizes. iPad display stands can be used in a wide range of applications for creating an interactive and engaging experience for your brand and your customer. 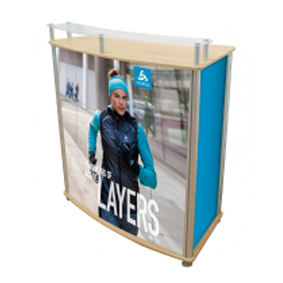 There are many benefits of adding promotional display counters to an exhibition stand. 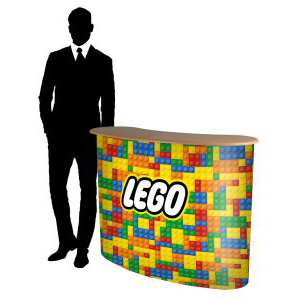 They create a structured and formal meet-and-greet area that mimics the professionalism of your brand. 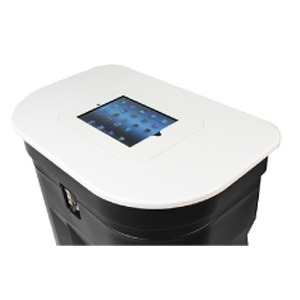 Portable counters also offer you additional marketing space and internal storage. 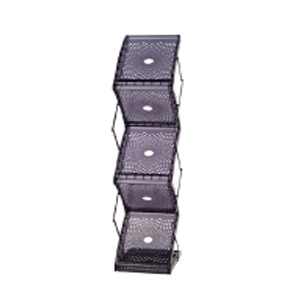 They are load-bearing but lightweight, making them perfect for showcasing key products. The frames disassemble and pack away for easy storage. This also means they are exceptionally easy to transport as they can fit into almost any car. 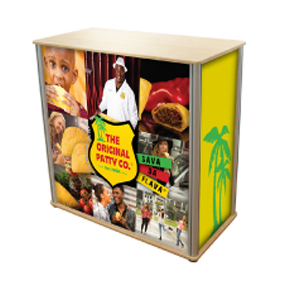 Promotional counters allow you to entice and communicate with visitors whilst building on your brand identity. 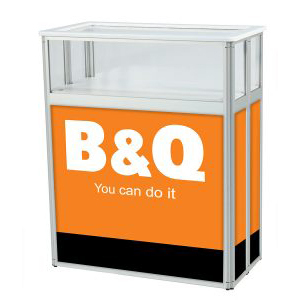 Ready to use in minutes, exhibition counters have a tool-free assembly and can be easily self-built in minutes. Designed to provide a useful yet high impact experience for both your brand, and your customers. Perfect for retail environments, our demonstration counters are ideal for in-store sampling or tasting events in supermarkets or shopping centres. Display counters are available with printed graphics and additional header panels which provide extra height and visibility for your event whist enhancing brand awareness. 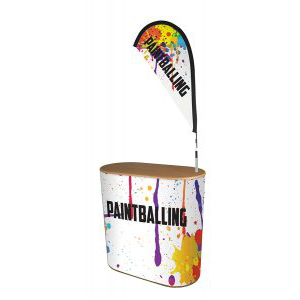 Choose from plain fabric wraps or customised printed graphics depending on your event needs. Our illuminated range of LED display lightboxes provide extra visibility and brand appeal. Whether you are a seasoned exhibitor or new to the exhibition industry; a printed tablecloth is an essential part of any exhibition kit. 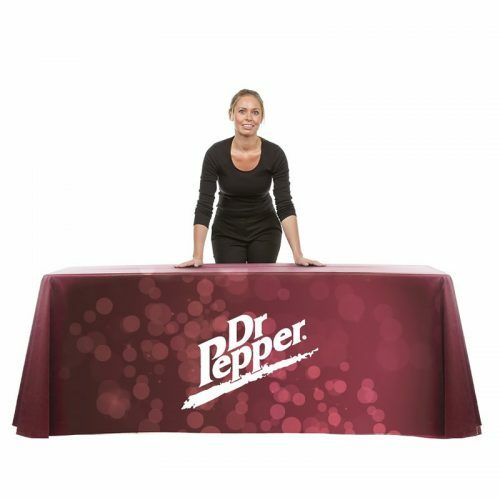 Our branded tablecloths and table runners are extremely versatile and can be used for any event including exhibitions, trade shows, craft fairs, conferences or any event where a branded presence is essential. Our logo cloths are the perfect solution for adding style and improving the overall finish of your exhibition stand. Available in 19 stock colours and a further eight special colours if you need them. 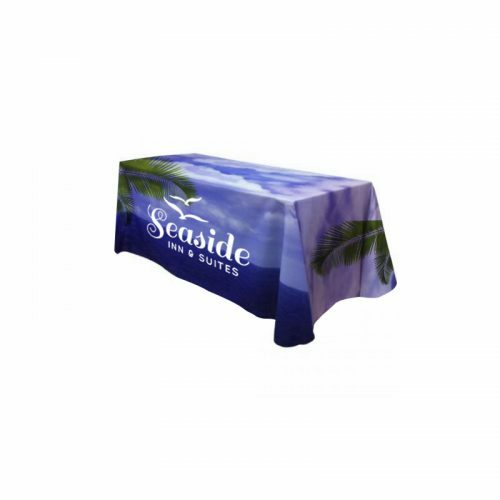 Choose form 5ft or 6ft printed tablecloths. The superior quality of our branded tablecloth is immediately apparent. The 220gsm polyester cloth is overlocked and hemmed to improve the drape and finish of your exhibition cloth. 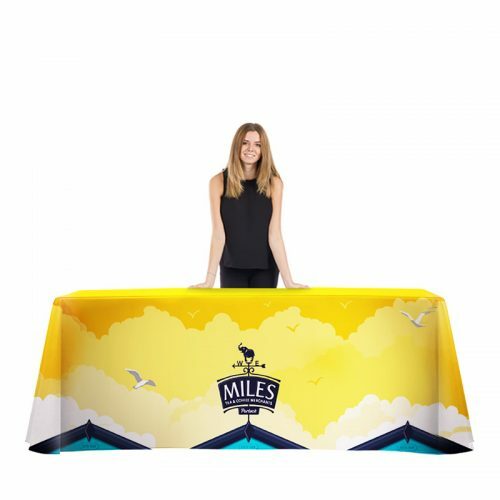 Full print tablecloths are perfect for businesses looking for that next level of branding. The only restriction of full print tablecloths is your imagination. 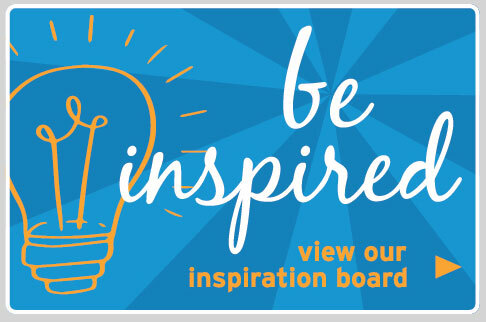 Available with edge to edge artwork for maximising your marketing potential. Choose from 5ft or 6ft tablecloths with the option of bespoke sizes if you require something a little bigger. We have no logo set-up fees for our printed tablecloths, which means there are no additional costs to your order total, and the price you pay includes logo set up, print and packaging. Our custom printed tablecloths are extremely cost effective and add the perfect finishing touch to an exhibition stand. 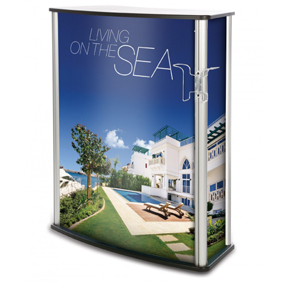 Lightweight and portable, they are one of the most affordable and portable exhibition stand components on the market. Marketing material including leaflets, brochures and magazines are a great way to heighten interest in your product or service. 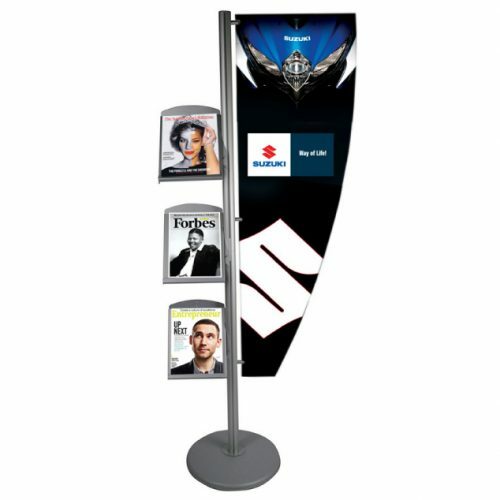 Brochure stands are the perfect solution for dispensing important marketing materials in a way that draws in your potential customers. Strategically place them on the edge of your exhibition stand to attract the attention of passers-by. 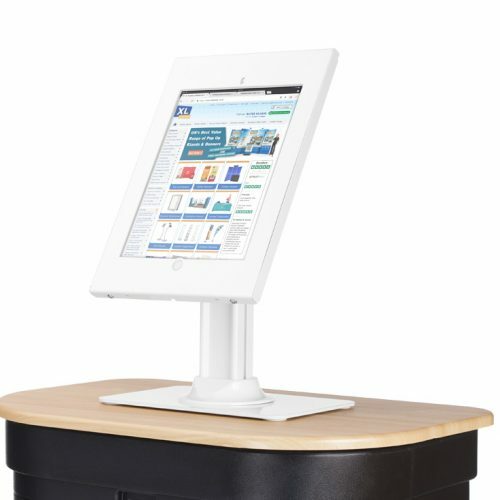 Our range of literature stands means there is no longer a need to have bulky piles of paper sitting on a table. 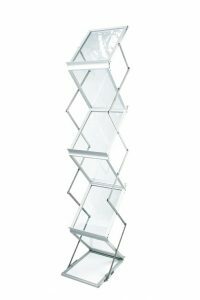 Instead, literature can be showcased and dispensed in a sleek and stylish way that takes up minimal floor space. 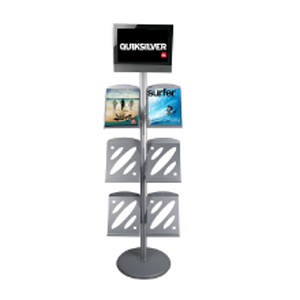 Leaflet and brochure stands are suitable for use in retail, showrooms, receptions and information centres, as well as offices, training facilities and museums. They are available in a range of sizes to suit A4, A3 and A5 brochures and leaflets. 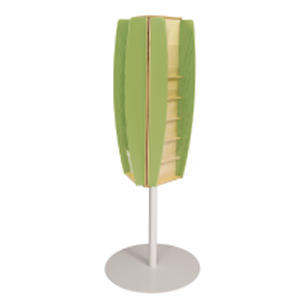 You can also choose from freestanding or desktop solutions for reception areas or podiums. 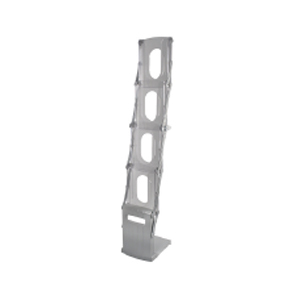 The small footprint of the leaflet holders ensures that valuable exhibition floor space is not taken up, but that your marketing potential is maximised for your event. 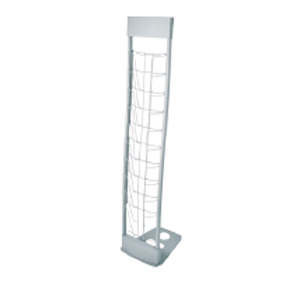 We have a wide range of leaflet holders available – simply get in touch. We are more than happy to help you choose the right solution for you. iPad stands and tablet displays are ideal for a variety of applications, including exhibitions and events, in-store promotions, restaurants, interactive displays, receptions, trade shows and much more. Our wide range of iPad and tablet display stands are available in as wall mounted, desk mounted and our most popular floor standing options. They provide a sturdy platform for you to present your brand in a professional, usable, accessible and stylish manner. 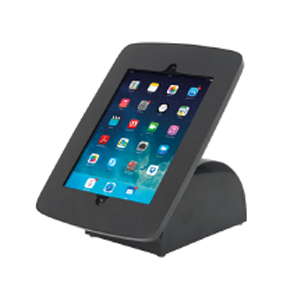 iPad display stands provide full access to all iPad functions whilst even providing access to power, increasing the longevity of usage. 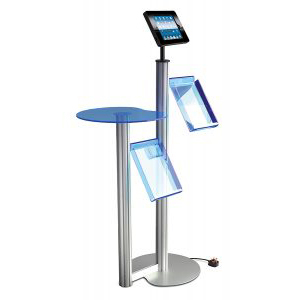 iPad stands allow you to create an interactive experience whilst engaging your audience with your brand. Perfect for the digital world we live in, the iPad holders provide access to a large library of digital media and video content which is a simple swipe away. 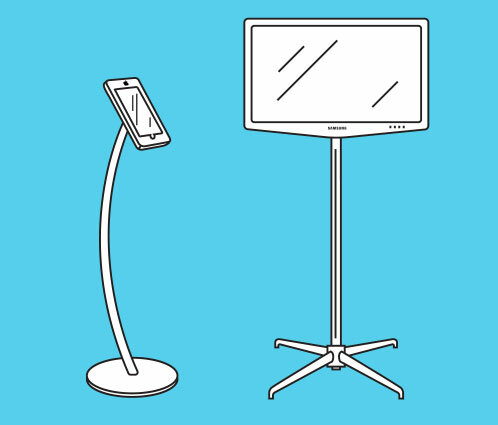 Boost interactivity and engagement by adding iPad stands to your exhibition display. 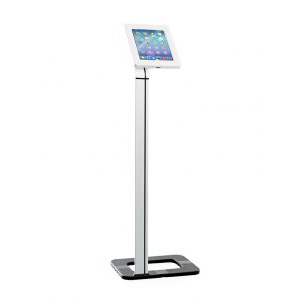 iPad stands are perfect for encouraging potential clients to come over to your stand and see what you have to offer. 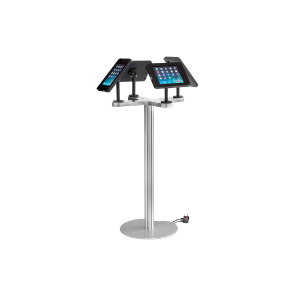 Effortlessly transported between events, each iPad display stand has a lockable enclosure which can rotate, swivel and tilt, allowing iPads to be used in either portrait or landscape orientation for maximum usability.